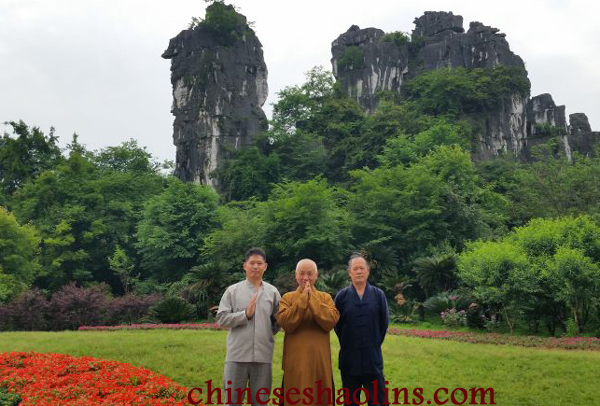 Headmaster meditated in shaolin temple. 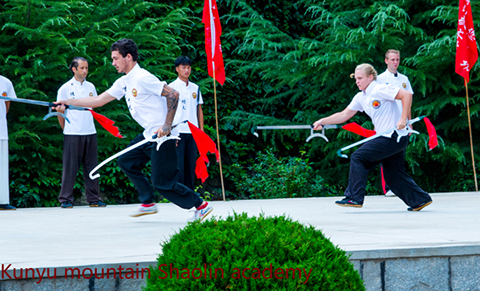 Kunyu Mountain Martial Arts Academy offers an opportunity for foreign students to study Chinese traditional martial arts. 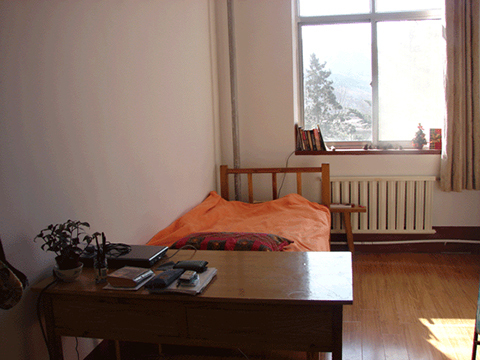 The academy was conceived when Chinese martial arts and traditional Confucianism, Taoism, Zen Buddhism, and Chinese Medicine were integrated. It was opened in accordance with the development of traditional culture, prevailed with the improvement of Chinese nation’s integral image, and has become more naturally prosperous by relying on the beautiful scenery and humanistic environment of the Kunyu Mountain..
Headmaster (one the left)attending the opening ceremony of Temple in YunNan Province with Abbot and Taoist leader(on the right). 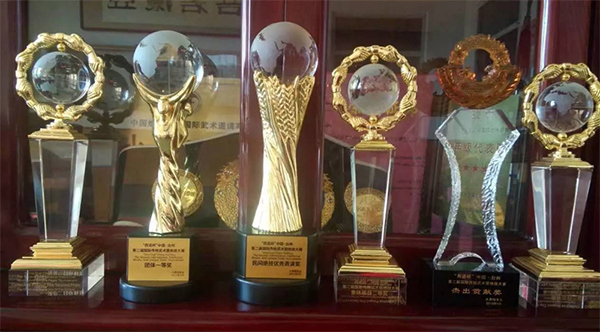 ●To make our school an elite school for decades, passing on the essence of martial arts. 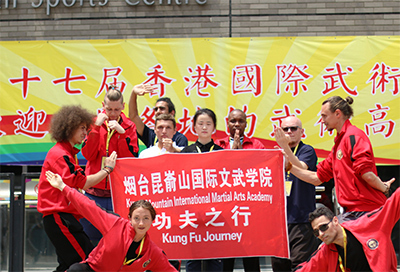 ●To become masters with advanced martial arts ability and honorable martial arts morality, teaching students who have perseverance and righteousness. 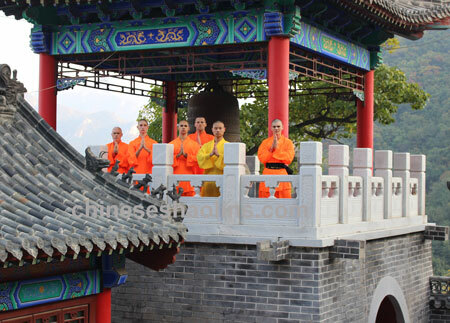 The school motto, which is also my wish for all students and teachers, is to have a bright future, a virtuous heart, ambitious goals, to be enlightened, and diligent.Regardless of your skin color, country of origin and religious beliefs, every person at the martial arts school in China will be respected equally. 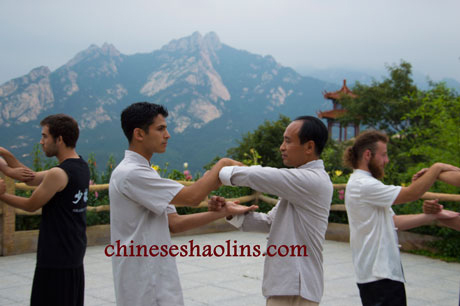 Regardless of your martial arts previous experiences and ability, every master will try their best to patiently help you with achieving your Chinese kung fu dream. This is our promise to you. Students training with master in Temple next to us. ● A dedicated belief and determination to succeed at the applied concepts and techniques of Shaolin Kung fu. ● Do everything with diligence instead of natural wisdom, with improvement instead of previous basics, with skills instead of body conditions, with virtue instead of money. You should try to be a martial arts practitioner with honorable martial arts virtue and advanced wisdom that wants to benefit the world with your special skills and make Your friends and the martial arts school proud. 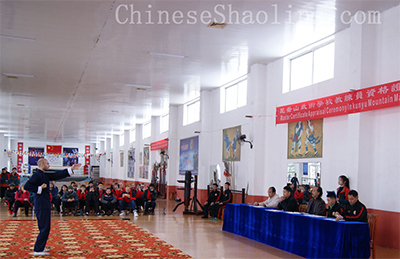 Kungfu Application training in Taoism temple. As a traditional martial arts progeny, I’ve benefited from many years of training and experiences. I developed a strong and healthy body and mind while also maintaining the purity of a deep cultural background of traditional martial arts. This was strengthened in the martial arts academy. Healthy body gives me a foundation to maintain my devotion to my martial arts career. The purified mind makes allows me to never lose confidence when becoming frustrated, makes me have a calm mind instead of being proud or sluggish when making achieving goals, makes me not lose myself, but keep improve when I feel lost, and makes me have a calm and clear mind to make right choices when facing the cross road of my life and career. As a martial arts progeny and beneficiary, my wish is to spread Kung fu to the world. 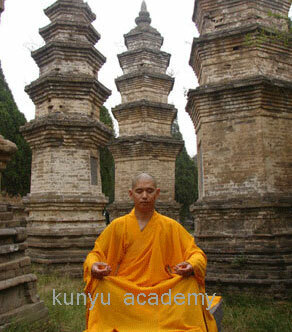 My working purpose is to help every kung fu practitioner to achieve their martial arts dreams. My responsibility is to make every practitioner achieve their martial arts goals. My dream is to let all people who can feel the appealing and unique power of martial arts benefit from it. All martial artists in the world are a family. 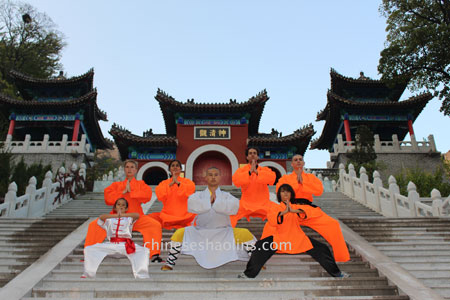 Let’s work on spreading traditional kung fu and promoting cultural treasure.